On Sunday Eddie Izzard came to Belfast here is a video of his journey from Southampton, to Bristol, Cardiff, Belfast, Birmingham and Nottingham on that day. There are some good clips of Belfast including our runners, him on a street lift, gate crashing wedding pictures and with our banner. Not forgetting the cocktail he got served in Malmaison. Enjoy. Don’t forget to vote Yes! tomorrow and take along your ID to the polling station. There are many videos about the Referendum on Thursday – this is one of my favourite at the moment, particularly given who the presenter is…. I’m proud to live in a country where we are free to make our own choices; but under the current system, that freedom of choice doesn’t extend to the voting booth. Under FPTP, two-thirds of our MPs that are sent to Westminster, even though the majority of their constituents voted against them. The referendum on Thursday is our chance to change all that – the winner under AV is the candidate that the majority are happy with. What could be fairer? 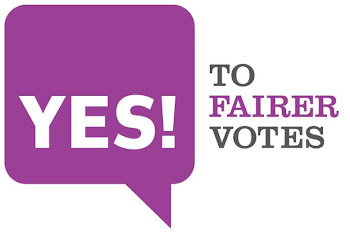 Join Dan Snow, Eddie Izzard, and many many others in voting Yes to Fairer Votes on May 5th. 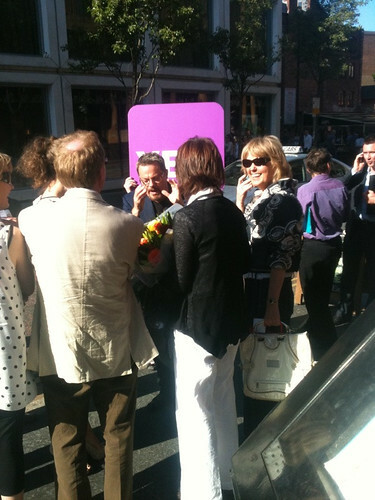 Eddie Izzard came to Belfast to say Yes! Today Eddie Izzard made a flying visit to Belfast as part of the build up to the vote on Thursday about changing the way we elect our MPs. Within an hour of his arrival, he had talked to people on the streets, leafletted outside Black Box, people on the streets and outside bars, given words of encouragement to runners in tomorrow’s marathon, met with political leaders, managed to get into two couples sets of wedding pictures (one with all the guests) and carried out various interviews with members of the press as he was walking along. 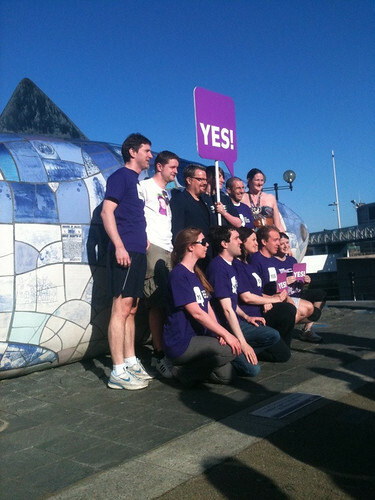 He’s also met with many of the people involved in the Yes! campaign here locally from many parties and none. People who have been pounding the streets of Northern Ireland, making phone calls, leafletting at many events letting people here know that a Yes! vote on Thursday is a vote that really matters. Eddie was in Paris Yesterday doing his stand up routine in French. But from today through to Thursday he is touring the UK encouraging people wherever he goes to vote to make a small change that will make a big difference to how we elect our MPs to Westminster. Join Eddie and many thousands of others by saying Yes! this Thursday. The answer is AV. The answer is YES! we’ve also found another cat’s take on Humans and Voting. The humans are thinking about changing the way they elect their MPs. At the moment, they use a simple system called first past the post. Everyone has one vote, and they get to vote for who they want their MP to be. The person with the most votes wins. It is just seven days until the polls open and among other things we get a chance to change the way we elect our MPs. Ordinary voters all across Northern Ireland will be turning out to say Yes! people like the Mullan family from Portrush. The Mullans may be voting in different ways on their ballot papers for the Assembly and Council elections next Thursday, but they agree on how they will vote on the AV referendum. “We’re from different political persuasions, but we’re united in the belief that the current system needs reform. We need to make the system to elect MPs fairer. That is why we are supporting YES! “At the last election, only three Northern Ireland MPs were elected on over 50% of the vote. This means that far too many of our voices aren’t counted, something which a YES! vote will change. It’s also easy to use, we’re already used to preferential voting here in NI, it’s as simple as 1,2,3. Why not join with the Mullans and thousands of others in Northern Ireland and say Yes! next Thursday, 5th May. Polls are open from 7am until 10 pm. McClarty joins growing Unionist voice for YES! 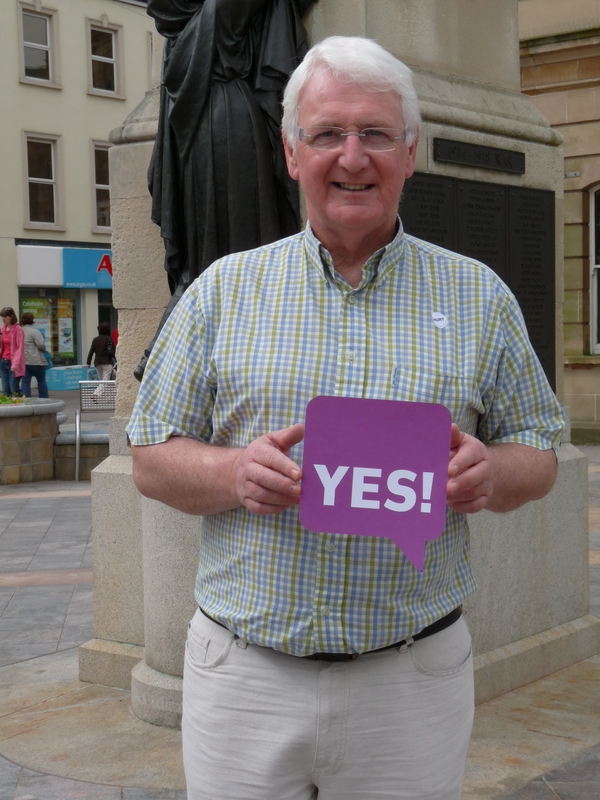 Londonderry East's David McClarty says YES! Watching tonight’s UTV debate on the Alternative Vote referendum you would think that all the unionists in Northern Ireland were saying no. That is not the case as member of the both the main unionist parties are supporting the Yes! campaign. But it is those outside the party machines who are standing up for fairness to the voters, something that is contrary to the no campaign’s claim that smaller parties and independents don’t support a move to the Alternative Vote. One of the first major unionist voices to back the Yes! campaign was Dawn Purvis who attended both our campaign launch and banner unfurling. One of the other independent unionists from the last Assembly, East Londonderry‘s David McClarty has also added his voice to the campaign for a yes vote next Thursday. David was one of the moderates who left the Ulster Unionist party as it took a more hardline stance after the last general election, an election in which they attempted to tie themselves to the Conservative party for political gain. David is on of the growing number of politicians in Northern Ireland who has realised that the people want fairness. When one five* in six of our MPs last May were elected with less than 50% support many voices were not heard. When the two main unionist parties attempted to stitch up a couple of seats by standing just one candidate against nationalist incumbents they showed contempt for the voters. It is something that they continue to do by saying no to the Alternative Vote. Not one of the DUP’s MPs secured over 50% of the vote last year, indeed the three MPs with the smallest mandate were all in the DUP. For each vote David Simpson, William McCrea or Gregory Campbell received there were 2 votes against. This shows that the current system is only fair to the politicians allowing them to get elected with as little as one-third of the vote. The Alternative Vote means that the winning candidate has to get over 50% of all the valid votes. That is a winning post that the politicians and parties cannot so easily control, that decision about who gets there lies in the preferences of individual voters. Elections will become more competitive as the candidates will have to reach out widely to gain that level of support. Vote Yes! 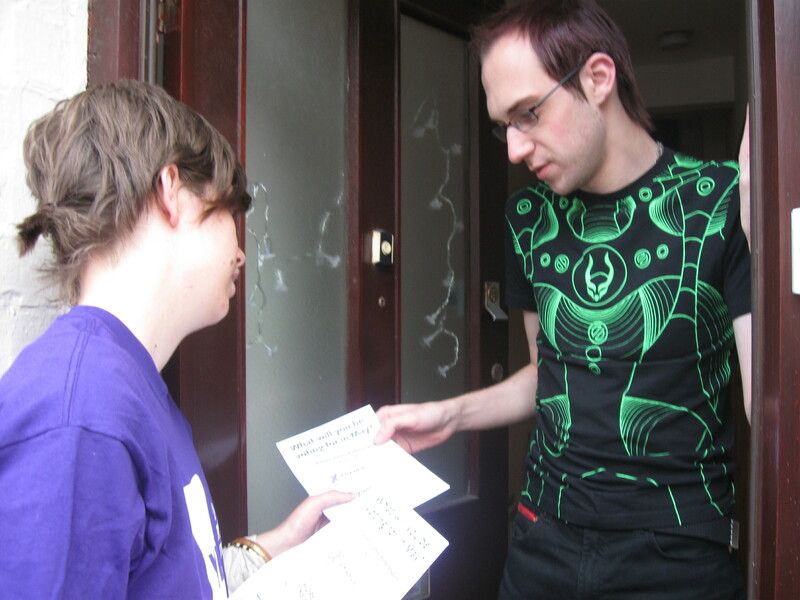 on the 5th May to have your say in who becomes your MP, to have your voice heard. Remember that to vote in Northern Ireland you need to take your ID with out on polling day between 7am and 10pm. * correction thanks to Joe Smith’s comment – nobody’s perfect.–Ed. A few weeks after the botched attempt by the NO2AV campaign* to rig a debate in Belfast on the subject of the Referendum on the voting system on May 5, it might have been better for the NO campaign if Brian Wilson had stayed at home tonight as well. Tonight was the Belfast Skeptics in the Pub – . 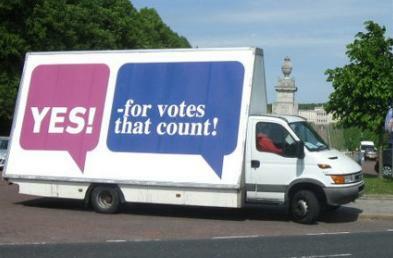 The invited speakers were Brian Wilson for the NO2AV campaign and Stephen Glenn for the Yes to Fairer Votes campaign. The evening was ably chaired by Conor Prendergastin the Club Room of the Parlour Bar, Elmwood Avenue in Belfast. Opening arguments from both speakers were to be about 10 minutes long. With a call of ‘heads’ from Brian and a toss of coin which showed ‘tails’, it was Stephen’s turn to speak first, followed by Brian, and then to questions from the meeting. The two speakers could not have been more different in style. The former MLA and current North Down councillor read a speech from his notes, and then proceeded to get his notes all in a muddle. Stephen, Party conference veteran and speaker against the SNP, Labour and Tories in hustings in several elections spoke without notes, presenting some key facts, together with real arguments. Stephen explained that last May in the Westminster election only three of our 18 MPs iwere elected with more than 50% of the vote; that 3 Northern Irish MPs only got 1out of 3 votes last May as well. Therefore 15 out of our 18 MPs were elected with a majority of voters not wanting them. Brian Wilson agreed with this. In fact, Brian Wilson agreed with most of what Stephen said. It was hard to see exactly why Brian Wilson was speaking for the NO campaign – other than his suggestion that in Northern Ireland, AV will result in a sectarian head count. I should point out that we heard no arguments tonight propounding the benefits of the current system known as First Past the Post**. – In 1951 94% of MPs in Westminster were elected with more than 50% of the vote in their constituencies. – Last year, in 2010, only 33.44% of MPs were elected in the same manner. FPTP is a system designed for an age of political tribalism which no longer exists. AV suits the electoral conditions prevalent in Britain today – particularly the shift to multi-party politics. Voters are much more promiscuous in the way they vote than in the past and AV is more adept at probing and reflecting the electorate’s political pluralism. There is clear support for AV among non-tribal voters. Brian Wilson presented no facts that I could discern from his rambling speech other than the fact that he was a member of the Electoral Reform Society and thought that we should vote NO at this point as AV was not really a reform that was worth campaigning for. but it was coming quite close. All in all, if the NO campaign can only muster a bumbling retired MLA as their spokesman with no clear, positive arguments for staying with the current system, I think it was clear tonight that there were more people being convinced by the well argued, well reasoned, factual points from the Yes campaign. As I remarked on the way home, if I had debated in the style of Brian Wilson when in the Ballymena Academy Debating Society, I’d have been laughed out of the society. It really does go to show that the Assembly on the hill at Stormont has a debating style worse than school debates. * When Brian Wilson MLA (as he then was) of the Green Party failed to turn up to the NO2AV’s debate in Belfast, whilst Stephen Glenn, of the Yes to Fairer Votes campaign did turn up. ** But what post? At least in AV there is a post of 50% of the vote. South Belfast voter Andrew Liggins says YES! to Fairer Votes. As you will see from here and other places online, the YES! campaign in Northern Ireland has been the length and breadth of the province – from Enniskillen, to Armagh, Belfast, Londonderry/Derry, Coleraine, Portrush as well as making the trip to Rathlin Island. Today the campaign is out and about in South Belfast connecting with local voters including Andrew Liggins who said he is voting YES! On May 5th Andrew’s MP, Alistair McDonnell who is a member of the SDLP will be voting YES as well. This will mean that in the next election he will need to get more than 50% of the vote to be elected.